While plenty of children’s books are imaginative, no amount of CGI can cover up the fact that a faithful adaptation to the source material should be the highest priority. 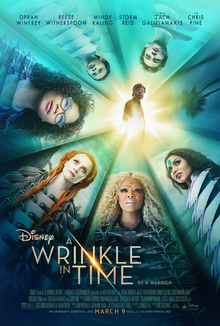 Unfortunately, due to the heavy Christian undertones in the original story, an anti-Christian Hollywood managed to churn out this loose adaptation of A Wrinkle in Time that doesn’t do much more than waste a few hours of your time. Sure, there are hints to such important ideas as faith, but they’re lost in lackluster character development that tries to “modernize” something that has been timeless for decades. Each of the sequences in this film merely seems like an excuse for gorgeous set design. If anything, the alien worlds and settings are neat to look at, but they don’t do much to distract from the events that just happen without much explanation as to why, or what purpose they serve. For instance, the scene with the identical houses and families all acting in synchronicity (one of the scenes from the trailer) is visited and exited in a matter of moments, and there was no point or moral lesson to teach there. It just was. Then it was not. Perhaps the most frustrating part of the film was the main characters. When Meg (Storm Reid) was describing all her faults, I had to stop and think: did the movie show us these faults? Some of them were accurate, but most didn’t seem to be obvious character flaws that she was trying to overcome, or at least not ones that were presented earlier in the film. Consequently, all the characters felt as flat as a visit to a 2-dimensional world (which, ironically enough, was a scene from the book that didn’t make it into the movie). A hollow adaptation with flashy visuals and nothing else, I give A Wrinkle in Time 2.0 stars out of 5.